Appointed Group CEO of St John of God Health Care in February 2002. More than 30 years’ experience in healthcare management – the last 23 years as Chief Executive Officer of large, complex, multi-campus healthcare organisations. 2010 WA Citizen of the Year Award winner in the industry and commerce category. Under Dr Stanford’s leadership, St John of God Health Care has significantly expanded its number of operating divisions, greatly diversified its range of services, increased five fold its size in terms of revenue, and become a recognised leader in the provision of high quality healthcare. More than 30 years’ experience in the Australian health sector including leadership roles in public and private hospitals and within the Catholic healthcare sector across NSW, Queensland and Victoria. Previous roles include: CEO St George Private Hospital, Ramsay Health Care; General Manager Corporate Services St Vincent’s & Mater Health Sydney; Executive Director Mater Private Hospital, South Brisbane, and Project Manager and General Manager, Hawkesbury District Health Service. More than 20 years’ experience in the healthcare industry including nursing and executive leadership roles. Previous role as Chief Nursing Officer and Executive Director of Surgery and Specialist Services at Melbourne’s St Vincent’s Hospital. Fellow of the Williamson Community Leadership Program. 30 years’ experience in the Australian healthcare system across public, private for-profit and not-for-profit hospitals and the aged and community care industry. Previously Chief Operating Officer, Mercy Health. Extensive international medical care and health management experience, including strategic planning and service redesign, clinical governance, and enterprise risk management at The Alfred, Cabrini Health and South East London Strategic Health Authority. Adjunct Associate Professor, Monash University. Fellow, Williamson Community Leadership Program. More than 20 years’ experience in human resources management in the private and public sectors of the healthcare industry including Ramsay Health Care and independent consultancy. Significant achievements as a senior executive including Australian Employer of the Year Award 2009 and Community and Health Services Industry Award 2009. Experience in the development and implementation of clinical and non-clinical ICT systems in public and private hospital environments. Previous roles include Medical Leadership Advisor for the WA Institute for Health Leadership, Clinical Lead for ICT Commissioning at Fiona Stanley Hospital, Doctor at public and private hospitals in WA. Also serving as a Member of the Board for the Child and Adolescent Health Service of WA. 24 years’ experience in finance including more than 18 years with St John of God Health Care. Fellow of the Institute of Chartered Accountants. Recipient of the 2010 40 under 40 Award (WA). Member of The University of Notre Dame Finance Audit and Risk Committee. Substantial experience leading teams of governance professionals in the areas of risk management, compliance, internal audit, legal services and company secretariat, across a number of highly regulated sectors including banking and finance, higher education and electricity networks. Previous roles include eight years as Western Power’s General Counsel and Company Secretary, in addition to a similar role at Murdoch University and BankWest, private legal practice, the courts’ administration and government. Completed a Master of Laws (with distinction) in 1998 from the University of Western Australia. Management experience within the healthcare industry spanning more than 30 years. Externally recognised for his role in establishing nursing, pathology and rural health programs in Timor-Leste. 25 years’ experience in the professional leadership and management of large-scale health and social service organisations in the Catholic not-for-profit sector. Completed a Masters of Business Administration in 2014 at the University of Melbourne following degrees in social sciences and nursing. Commenced Masters in Spiritual Direction, Melbourne College of Divinity. 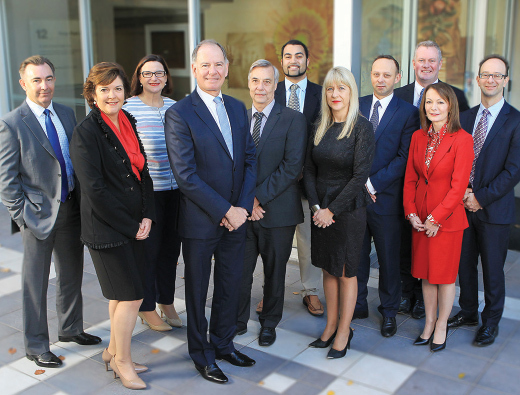 Left to right – Mr John Pease, Mrs Tracey Burton, Ms Marcelle Mogg, Dr Michael Stanford (GCEO), Mr Kevin Taylor, Dr Alexius Taylor Julian, Ms Cynthia Dowell, Mr Bryan Pyne, Mr John Fogarty, Ms Rita Maguire, Dr Mark Lubliner.